It’s time for everyone to get up and wave your hands in the air like you just don’t care. Yes, it’s Friday dance time here at Madtini World Headquarters. 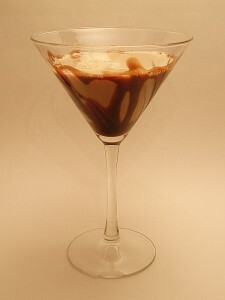 This Friday, we’re taking our cocktail clue from the good folks over at GirlyDrinks.com to make a toast to the weekend with a glass of liquid chocolate-coffee awesomeness. Cheers, here’s to the weekend! Drizzle chocolate syrup around the inside of a chilled cocktail glass. Return glass to the freezer. Combine the white chocolate liqueur, Kahlua and Baileys in a cocktail shaker with 2-3 ice cubes. Shake for 7-8 seconds. Strain into the chilled cocktail glass and serve to your chocolate loving friends.